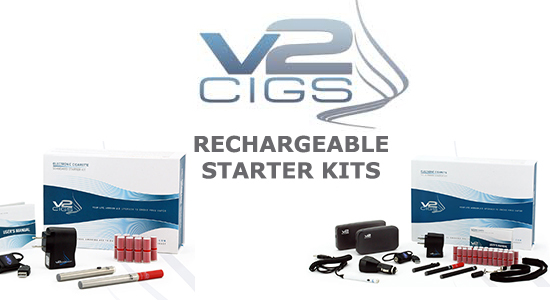 V2 Cigs now offers 6 different starter kits to let their fans pick and customize the perfect package for them. Now with the new EX Series powerful batteries and long lasting new technology cartridges, you can upgrade any starter kit to EX Series for just $20. 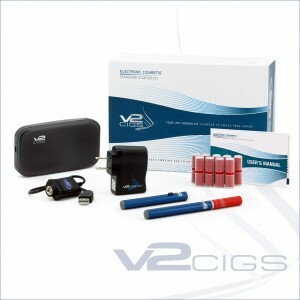 V2 Cigs delivers a top grade electronic cigarette and the starter kits reflect the same quality. Although V2 Cigs also offers a great disposable electronic cigarette, for regular users, vaping is much cheaper with rechargeable kits. Disposables are great for trying new flavors and brands before committing to a purchase, and for casual vaping alike. For those looking to get the best value, check out the latest Starter Kits offered at V2 Cigs, and if you want to learn more about the product, read our V2 Cigs Review here. The V2 Power-Cig is not really a starter kit. It is a stand-alone USB wire powered electronic cigarette. As opposed to being a rechargeable battery, it needs to be plugged to any type of USB port for power. It provides more power than the regular rechargeable battery models, hence the name V2 Power-Cig. It produces a very think cloud of of vapor and keeps optimal heating temperature on the e-liquid atomizer. Since it is USB powered, it does not have a limited life-span like batteries do. It’s great for use at home, office, car or anywhere you could plug in. The Beginners Kit is good for someone that is just starting out vaping but is not certain about sticking with it. The small investment allows the buyer to try out both the rechargeable e-cig as well as the V2 Disposable e-cigarette. 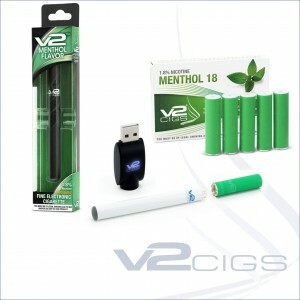 The kit is limited to one of two of their most popular flavors (V2 Red Tobacco or Menthol) and 1.8% nicotine strength. A sampler pack of cartridges can be added to try out all the flavors. The Standard Kit is a better choice for a regular vaper. It offers better value and practicality with two batteries. The additional wall charger is much faster than USB and a must to keep you on the go. Pick from all flavors and strengths. Recently upgraded with the new V2 Smart Charger, which has it’s own chip to avoid overcharging your batteries and cuts charging time in half. Buyers on a budget will usually be interested in the V2 Standard Starter Kit. The Standard Plus Kit is identical to the Standard Kit with an additional V2 Charging Case. The portable charging case can charge 1 battery 4 times on a full charge. It also has space to carry 1 battery and two cartridges. It also comes with the awesome V2 Cigs Smart Charger for long battery life and blazing fast recharge time. V2 Standard E-Liquid Kit – NEW! The Standard E-Liquid Kit finally meets the needs of refill users. To save the most money, refill e-liquid bottles reduce the cost of refills to a small fraction and is well worth it! The EX blank cartridges are well designed and are known as possibly the best blank electronic cigarette cartridges on the market. It’s very easy to use, making it a great pick for any beginner that wants to get the most out of his investment. V2 Standard Kit – EX Series – NEW! 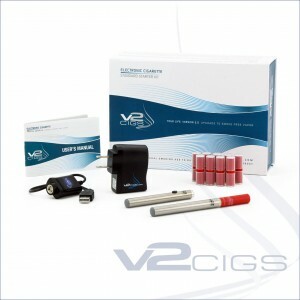 The V2 EX Standard Kit is V2 Cig’s latest upgrade to their line of high performing technology. It is just like the Standard Kit but for $20 more you get EX batteries and cartridges instead. The EX Batteries and cartridges are both superior in performance compared to the regular batteries and cartridges. The EX Batteries are 100 mm long and are only available in automatic mode. They are designed to be lightweight while still providing long lasting charges. The V2 EX Cartridges are designed to last for 400 puffs. This starter kit is perfect for the regular user who is looking for the latest V2 Cigs has to offer. V2 Standard Plus Kit – EX Series – NEW! Once again, the same as the Standard Plus Kit but for just $20, you get a full upgrade to V2 EX Series batteries and cartridges. We have personally tested the new EX devices and firmly suggest to go for the upgrade when purchasing a V2 Starter kit, along with the 15% coupon code, it’s definitely worth it and will save you more money in the long run. Standard Plus EX Kit includes the same great V2 portable charging case. The Couples Kit is perfect for two. Doesn’t matter if it is shared with your loved one or friend, this is a great way to get an additional discount on cost and you both get the equivalent of the Standard Kit. It also now features the smart charger upgrade and with 20 flavor cartridges split in 4 x 5 packs, it allows to try out many flavors together. Great as a gift idea when buying a starter kit for yourself. V2 Couples Kit – EX Series – NEW! For $40, you can upgrade both kits to EX batteries and cartridges, for longer life cycles and 400+ puffs per cartridge. As we mentioned previously, we really enjoy the V2 EX Series, but if you are on a tight budget, the standard ones provide an almost identical performance in terms of vapor and flavor. The EX series has an extra kick and better performance overall, so if you can afford it, go for it. The Ultimate Kit is made for the V2 Cigs vaping aficionado. Very often offered and promotional pricing, this kit has pretty much everything to gear you from top to bottom at the best value for your money. If you want the cream of the crop in electronic cigarette Starter Kits, look no further. V2 Ultimate Kit – EX Series – NEW! 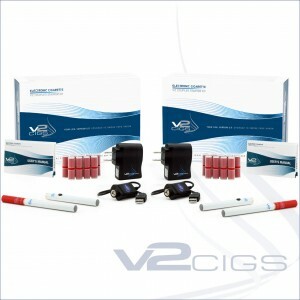 For just $30, the V2 Cigs Ultimate Starter Kit can be upgraded to EX Series. tTe investment value is great enough to put in the extra $30. In our humble opinion, this latest option makes the standard Ultimate Starter Kit a second choice for most. However, some users might prefer the standard batteries and cartridges, for that reason we don’t rule it out as the product still stands as a great smokeless electronic cigarette.